Tamboran Resources Ltd, the Australian-owned company with a petroleum licence for the Lough Allen Basin, are right now preparing to drill an exploratory borehole at a quarry just outside Belcoo in Co. Fermanagh. They moved in and put up security fencing with razor-wire in the early hours of July 21st when people were sleeping. Find out more from the links under ‘Stay up to date’, below. Minister for the Environment, Mark H Durken is due to make a decision shortly about whether the drilling will be allowed to go ahead. You can join with hundreds of others in opposing this drilling by clicking here or the link below under ‘Action you can take’, and sending an email to the Minister, asking him to do the right thing. The Northern Ireland Environment Agency is currently undertaking a consultation on Significant Water Management Issues. The deadline for responses is 22nd June 2014. Email and postal addresses are included below. The consultation documents for each of NI’s three river basin districts refer to the risks posed by mineral extraction and refer to unconventional gas exploration and extraction. They all say the same thing. Here is an extract from the North Eastern River Basin District consultation document, p31. [emphasis added]. “Pollution of surface waters can occur as a result of run-off from the land area around a quarry or mine, hydrocarbon or herbicide spills, excess herbicide or fertiliser applications, run-off from soil and spoil heaps which may contain toxic metals and phosphates. Pollution of surface waters can also occur indirectly by pollutants being transported in groundwater. Mineral extraction by its very nature poses risks to groundwater. Removal of the overlying land in the working area means that the vulnerability of the groundwater to pollution is increased as the natural protection is removed. Therefore, it is important that proper precautions are taken to ensure the risk of pollution is minimized. Pollutants may include oils, fuels and hydraulic fluids, metals (for example, Cadmium, Mercury), pesticides, flocculants used in settlement ponds and nutrients. Unconventional gas exploration and extraction refers to the use of high volume hydraulic fracturing (fracking) of previously impermeable rock to permit the extraction of natural gas on a commercial scale from unconventional sources such as shale gas deposits, coal seams and tight sandstones. At present, there is no exploratory or commercial drilling underway in relation to this in Northern Ireland. What are we already doing about this? New legislation was introduced through the Planning Reform (Northern Ireland) Order 2006 which requires the initial review of old mineral permissions. Mineral mapping has been undertaken to highlight where specific reserves are located, what type they are and what constraints exist in the form of environmental designations. Northern Ireland Government Departments, through the shale gas Forum, are in the process of identifying the regulatory framework applicable to onshore oil and gas exploratory activities in Northern Ireland, and the linkages between the existing regulatory regimes. Such activities may include high volume hydraulic fracturing. As part of the planning process, NIEA requests hydrological risk assessments for quarries, to assess risks from dewatering and how they can be mitigated. NIEA provides guidance notes for applicants. Possible options that could be put in place? People can respond to this consultation at a general or local catchment level. environment in the North Eastern [or other] River Basin District? environment in your Local Management Area? 3. How do you think these issues should be addressed, and what would you choose to do first? 4. Are there any projects that we could work on in partnership to help improve the water environment in North Eastern [or other] River Basin District? Bushmills, Wed 28th May – 7.30pm, Dunluce Parish Centre, 13 Priestland Rd. 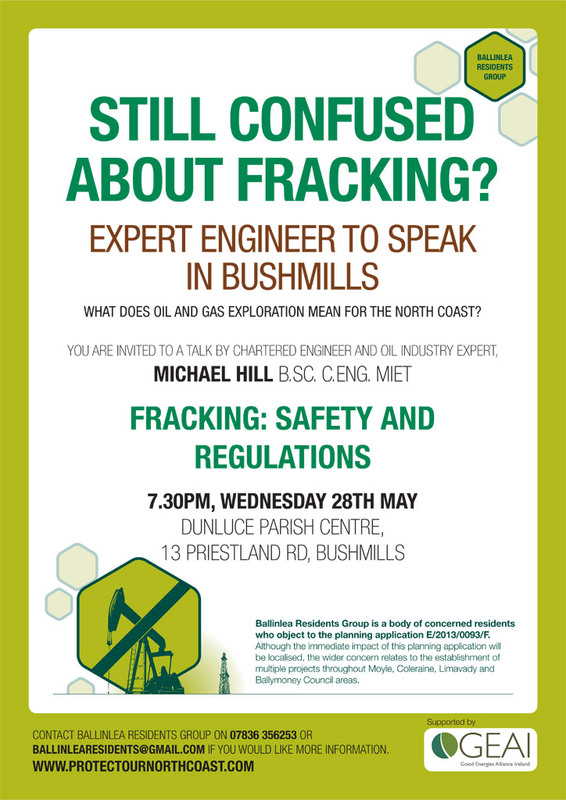 Mike Hill, Chartered Engineer, with oil industry experience, will be talking about Fracking, Safety and Regulation. James Orr, Director of Friends of the Earth Northern Ireland, will be providing an overview of NI’s track record with regard to environmental regulation, monitoring and enforcement. The official end-date for public consultation in this period is 17th April – BUT, you can continue to raise issues and send in your concerns after this date. Ballinlea residents have been told that they will still be considered right up until a decision is made about whether to grant planning permission or not, so please keep sending in your concerns and objections – it is not too late! 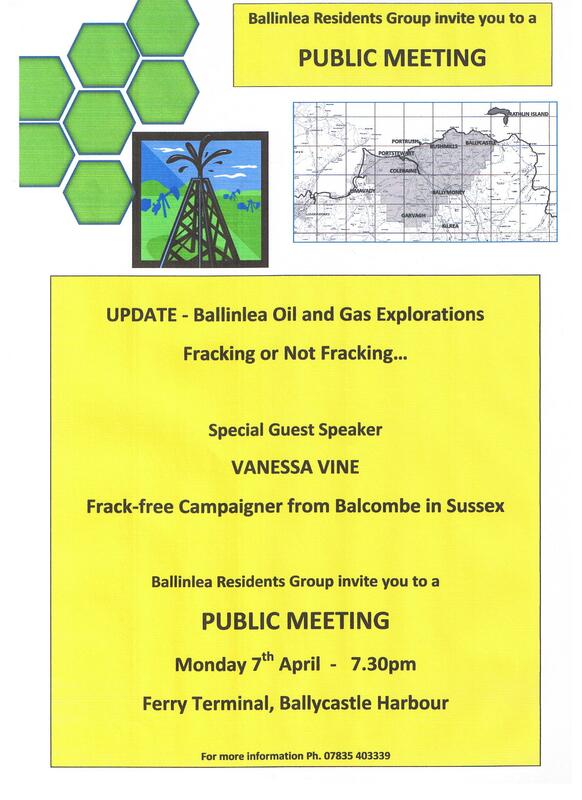 Object again to drilling at Ballinlea! Rathlin Energy Ltd have finally submitted much more detailed information to the Planning Service (upon request) about what they intend to do at the proposed Ballinlea drilling site. It includes more detail about the processes including the Conventional Hydraulic Fracturing, Mini Fall-off test and Acid Squeeze test, and more information about the expected levels and directions of toxic emissions from the flaring of gas, which is particularly concerning to people living within half a mile. There are 43 households within half a mile, and 140 within 2kms. Obviously if this industry was to progress, and high numbers of wells were to be developed, the effect would be cumulative and impact on a very high number of households, across a wide area. Read below for how to see the information they have submitted, and how to object to the planning application. You will see the company’s information mostly under “additional information”, and the most recent ones have a 20/03/2014 publication date. There is also a separate “drawings” folder and “mining waste management plan”. Letters from the department to the company and to statutory consultees (other government agencies) are under the “supporting documents” folder and letters of objection (there are long ones and short ones) are under “representation letters”. The planners and other government departments are not experts in this area – this type of planning application is new in the UK and especially new in Northern Ireland – so they need all the help they can get to determine whether the information being provided by Rathlin Energy is fully accurate, comprehensive, and doesn’t pose undue risks to environmental and human health. We think the proposal does pose undue risk to environmental and human health and we think it is important to point out any new research or information to the people making the decisions about this. Please, if possible, adapt your letter/email to include your own points of objection.